Do you ever go in waves where sometimes you're knitting like Armageddon is tomorrow and other times you can hardly look at your stash let alone pick up some needles? If you don't, well, you're the envy of all knitters and your LYS should thank their lucky stars they receive your constant support! I, on the other hand, am not so blessed (and I like to believe I'm normal in this respect). I have these knitting bipolar moments quite frequently - one minute I'm hot and the next I'm not. But, I think I've finally found a cure to my knitting doldrums. I've discovered my knitting muse. No, I'm not pulling your leg. I'm being completely serious. However, my muse doesn't look like a Greek goddess...oh, it's far from that. My muse is not even a living being, sorry hubby. My muse, oh, sweet muse, is the mall. 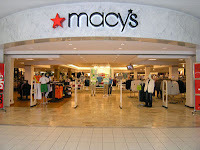 Every time I go shopping I wander the pathways of Macy's, Banana Republic, Express, GAP, whatever and every scarf or glove or hat or sweater I see I think, "They want how much for that! You've got to be kidding me! I could totally knit that no sweat." So, after a few hours of perusing, I'm inspired to go home and get my needles movin'! Have you noticed how you go to the mall and they want $70 for a cable sweater that feels like it was knit with yarn one would give to their cat as a toy? Then, you go to Target and they want $10 for a scarf and I get all angry because that kind of low-balling completely destroys the hand knit market. Well, that's another topic for another day. Back to my muse. I'm so lucky I don't shop with my eyes closed or else I'd spend a fortune because after a while, us knitters can feel the minute differences between quality yarn and cheap, mass-produced fibers that are only out there to make a yearly profit, not to last 4 seasons. The only good thing about going sweater shopping at the mall instead my favorite knitting magazine is that I can get some fabulous inspirations for stitch patterns, pattern combinations and style and fit. Since I've been home (less than 36 hours) I've finished one project, tentatively designed my next project and have begun the new design. It's amazing what I can accomplish after a few hours at my local Macy's. Do you have a knitting muse? I know you do. Don't lie. If you're feeling "out of the mood" to knit, what do you do to snap yourself back to reality? Come on, share it...you know you want to!